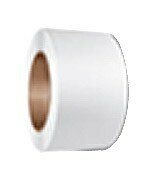 PP Strapping Roll Plain We at AAURO PPACK Have the infrastructure to manufacture all types of Polypropylene strapping from 5mm to 19 mm in width specified thickness and quality to suit your requirement . Further it is Available in any size any color you specify . Also printing Facility Available as per Customers design.